AES provides efficient, reliable and competitively priced waste collection services. We have been in business for over 15 years and our customers’ satisfaction matters to us personally. If you would like a quote, a free waste audit, or a confidential discussion about your waste collection and recycling services, please give us a call on 045 439000 or email us on commercialenquiries@aesirl.ie – where a member of our sales team will be pleased to help. Constantly moving beyond the target of ‘Zero to Landfill’, AES’s bespoke waste management solutions provide sustainable services that seek to view waste as a resource. Managing waste is an increasingly complex issue and at AES, we comply with all new legislation, regulations and environmental responsibilities. AES will work in conjunction with your staff to deliver a tailored solution that meets your complete waste management needs, establishing and customising your waste services to the ideal package that optimises recycling. Our focus is on cost-effectiveness and our goal is to save you money as we put in place an ideal plan for the collection, sorting, treatment, recycling, reprocessing and management of all your waste management needs. AES provides the complete solution to every aspect of your on-site waste handling. 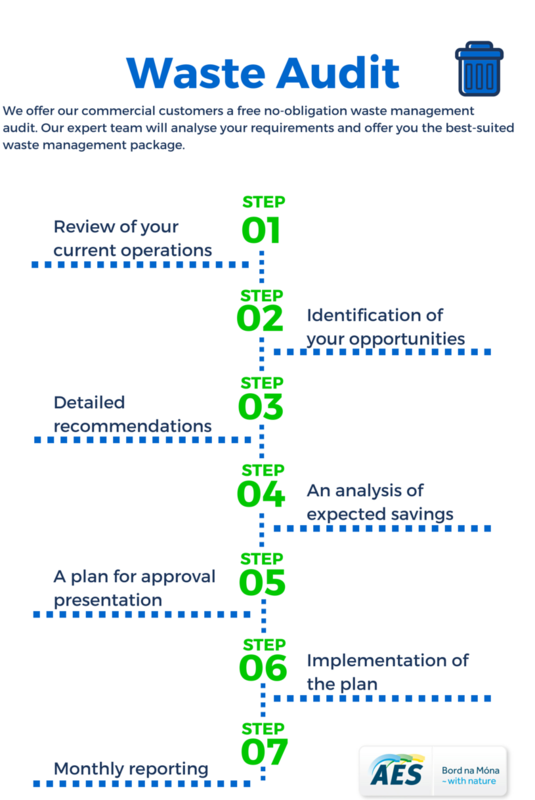 The first step is a free no-obligation waste management audit by our expert team to analyse your requirements so that we can offer you the best-suited waste management package. To view our waste audit process please click here. At AES, we class waste as a resource, not a problem. We help our clients to manage their waste output efficiently and economically, to reduce, reuse and recycle their waste. We sort, recycle or look to re-use collected waste materials as the raw ingredients for next-generation products, for re-use in the manufacture of construction and other valuable consumer and environmental materials. Our experience of business waste management solutions comes from a wide range of clients, across a diverse set of industries. Waste collection and recycling is a highly regulated industry and we can provide the peace of mind which every busy organisation needs. We can ensure you have all the appropriate documentation in place to meet legal requirements with confidence. AES operates and manages large-scale non-hazardous waste collection, and does so in accordance with stringent Environmental Health & Safety standards. AES’ bespoke computer software manages all consignments of waste from enquiry, to classification, collection, treatment and certification of disposal/recovery/recycling. Our reporting system ensures full traceability on all your waste from initial collection to final destination. With over 15 years of operating experience, AES offers an affordable, reliable skip hire service to our business customers. Our online skip order service is designed to make it simple and straightforward. For general skip sizes for household needs please click here. For larger skip sizes for business and construction needs please click here.